Your fuel tank is not equipped with a fuel filler cap. You can insert the filler nozzle directly into the filler neck. The tank seals itself again when you pull out the filler nozzle. 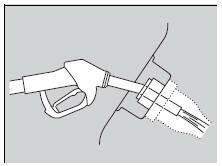 Stop your vehicle with the service station pump on the left side of the vehicle in the rear. Press the area indicated by the arrow to release the fuel fill door. You will hear a click. ► Driver's door must be unlocked. WARNING Gasoline is highly flammable and explosive. You can be burned or seriously injured when handling fuel. Stop the engine, and keep heat, sparks, and flame away. 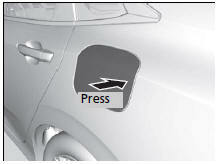 The fuel filler opening is designed to accept only service station filler nozzles for refueling. Use of smaller diameter tubes (e.g., those used to siphon fuel for other uses) or other non-service station devices can damage the area in and around the filler opening. Use the master door lock switch to unlock the fuel fill door. The vehicle doors and fuel fill door automatically relock if the remote unlock function is used. This can be deactivated by briefly opening then closing the driver's door. The fuel fill door and its latching mechanism can be permanently damaged if the fuel fill door is forced closed when the driver's door is locked. Place the end of the filler nozzle on the lower part of filler opening, then insert it slowly and fully. ► Make sure that the end of the filler nozzle goes down along with the filler pipe. ► Keep the filler nozzle level. ► When the tank is full, the filler nozzle will click off automatically. ► After filling, wait about five seconds before removing the filler nozzle. Shut the fuel fill door by hand. The filler nozzle automatically stops to leave space in the fuel tank so that fuel does not overflow as a result of changes in air temperature. If the filler nozzle keeps turning off when the tank is not full, there may be a problem with the pump's fuel vapor recovery system. Try filling at another pump. If this does not fix the problem, consult a dealer. Do not continue to add fuel after the nozzle has automatically stopped. Additional fuel can exceed the full tank capacity. If you have to refuel your vehicle from a portable container, use the funnel provided with your vehicle.